An endosymbiont or endobiont is any organism that lives within the body or cells of another organism in a mutualistic relationship with the host body or cell, often but not always to mutual benefit. The term endosymbiosis is from the Greek: ἔνδον endon "within", σύν syn "together" and βίωσις biosis "living"). Examples are nitrogen-fixing bacteria, which live in root nodules on legume roots, single-cell algae inside reef-building corals, and bacterial endosymbionts that provide essential nutrients to about 10–15% of insects. The Rickettsiales are difficult to cultivate, because they rely on eukaryotic host cells for their survival. The Rickettsiales further consist of three known families, the Rickettsiaceae, the Midichloriaceae and the Anaplasmataceae. Most studies also support the inclusion of the Holosporaceae, but one study has challenged this view. Here, the Holosporaceae are the sole representatives of its own order, the Holosporales and as such not part of the Rickettsiales (see the schematic tree below). Other lineages, not clearly part of any family, have been described as well. Examples include Candidatus Arcanobacter lacustris  and Rickettsiales bacterium Ac37b. The Rickettsiaceae are a family of bacteria. 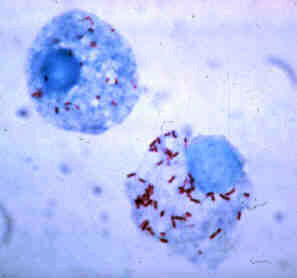 The genus Rickettsia is the most prominent genus within the family. From this family, the bacteria that eventually formed the mitochondrion is believed to have originated. Most human pathogens in this family are in genus Rickettsia. They spend part of their lifecycle in the bodies of arthropods such as ticks or lice, and are then transmitted to humans or other mammals by the bite of the arthropod. It contains Gram-negative bacteria, very sensitive to environmental exposure, thus is adapted to obligate intracellular infection. Rickettsia rickettsii is considered the prototypical infectious organism in the group. The Holosporaceae are a family of bacteria, formerly included in the order Rickettsiales, but now raised to their own order, the Holosporales. The member Holospora is an intracellular parasite found in the unicellular protozoa Paramecium. The Rhodospirillales are an order of Proteobacteria, with two families: the Acetobacteraceae and the Rhodospirillaceae. The Rhodobacteraceae are a family of proteobacteria in the order Rhodobacterales within the alpha subgroup. Like all proteobacteria, they are gram-negative. It contains chemoorganotrophs and photoheterotrophs bacteria. Many occur in aquatic habitats. The cladogram of Rickettsidae has been inferred by Ferla et al. from the comparison of 16S + 23S ribosomal RNA sequences. The phylogenetic relationship between these two groups has yet to reach consensus in the scientific literature. Early reports suggested that they represented sister clades to each other. However, later studies suggested that this relationship is false and was due to a phylogenetic artefact, which arteficially groups independent AT-rich and fast-evolving lineages (Rickettsiales and Pelagibacterales have both properties) together. Upon correcting for this artefact, the Pelagibacterales form a sister clade to the Rhizobiales, Rhodobacterales and Caulobacterales instead. Rhodobacterales are an order of the Alphaproteobacteria. Rickettsiales genomes are undergoing reductive evolution and are typically small (generally < 1,5 Mbp), AT-rich (generally < 40% GC) with a low coding density (generally < 85%) and a relatively high number of pseudogenes. Reduction in genome size, %GC and coding density and genes are generally attributed to genetic drift and Muller's ratchet. Genetic drift is enhanced in Rickettsiales genomes due to low population sizes (given their endosymbiotic nature) and frequent population bottlenecks. Similarly, Muller's ratchet is activated through the lack of recombination and horizontal gene transfer (the eukaryotic host cell is a natural barrier). Genetic drift is the change in the frequency of an existing gene variant (allele) in a population due to random sampling of organisms. The alleles in the offspring are a sample of those in the parents, and chance has a role in determining whether a given individual survives and reproduces. A population's allele frequency is the fraction of the copies of one gene that share a particular form. Genetic drift may cause gene variants to disappear completely and thereby reduce genetic variation. It can also cause initially rare alleles to become much more frequent and even fixed. In evolutionary genetics, Muller's ratchet is a process by which the genomes of an asexual population accumulate deleterious mutations in an irreversible manner. Muller proposed this mechanism as one reason why sexual reproduction may be favored over asexual reproduction. The negative effect of accumulating irreversible deleterious mutations may not be prevalent in organisms, which, while they reproduce asexually, also undergo other forms of recombination. This effect has also been observed in those regions of the genomes of sexual organisms that do not undergo recombination. 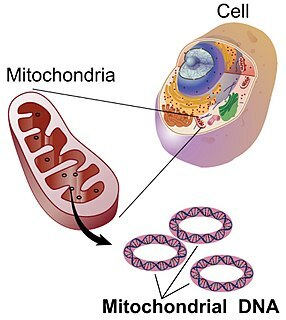 Mitochondrial DNA is the DNA located in mitochondria, cellular organelles within eukaryotic cells that convert chemical energy from food into a form that cells can use, adenosine triphosphate (ATP). Mitochondrial DNA is only a small portion of the DNA in a eukaryotic cell; most of the DNA can be found in the cell nucleus and, in plants and algae, also in plastids such as chloroplasts. The opisthokonts are a broad group of eukaryotes, including both the animal and fungus kingdoms. The opisthokonts, previously called the "Fungi/Metazoa group", are generally recognized as a clade. Opisthokonts together with Apusomonadida and Breviata comprise the larger clade Obazoa. Euarchontoglires is a clade and a superorder of mammals, the living members of which belong to one of the five following groups: rodents, lagomorphs, treeshrews, colugos and primates. Pelagibacter, with the single species P. ubique, was isolated in 2002 and given a specific name, although it has not yet been described as required by the bacteriological code. It is an abundant member of the SAR11 clade in the phylum Alphaproteobacteria. SAR11 members are highly dominant organisms found in both salt and fresh water worldwide – possibly the most numerous bacterium in the world, and were originally known only from their rRNA genes, which were first identified in environmental samples from the Sargasso Sea in 1990 by Stephen Giovannoni's laboratory in the Department of Microbiology at Oregon State University and later found in oceans worldwide. P. ubique and its relatives may be the most abundant organisms in the ocean, and quite possibly the most abundant bacteria in the entire world. It can make up about 25% of all microbial plankton cells, and in the summer they may account for approximately half the cells present in temperate ocean surface water. The total abundance of P. ubique and relatives is estimated to be about 2 × 1028 microbes. Caulobacteraceae is a family of proteobacteria, given its own order (Caulobacterales) within the alpha subgroup. Like all Proteobacteria, the Caulobacteraceae are gram-negative. Caulobacteraceae includes the genera Asticcacaulis, Brevundimonas, Phenylobacterium and Caulobacter. A bikont is any of the eukaryotic organisms classified in the group Bikonta. Many single-celled members of the group, and the presumed ancestor, have two flagella. The proto-mitochondrion is the hypothetical ancestral bacterial endosymbiont from which all mitochondria in eukaryotes are thought to descend. Midichloria is a genus of Gram-negative, non spore-forming bacteria, with bacillus shape around 0.45 µm in diameter and 1.2 µm in length. First described in 2004 with the temporary name IricES1, Midichloria species are symbionts of the hard tick Ixodes ricinus. They live in the cells of the ovary of the females of this tick species. These bacteria have been observed in the mitochondria of the host cells, a trait that has never been described in any other symbiont of animals. Capsaspora is a monotypic genus containing the single species Capsaspora owczarzaki. C. owczarzaki is a single-celled eukaryote that occupies a key phylogenetic position in our understanding of the origin of animal multicellularity, as one of the closest unicellular relatives to animals. It is, together with Ministeria vibrans, a member of the Filasterea clade. This amoeboid protist has been pivotal to unravel the nature of the unicellular ancestor of animals, which has been proved to be much more complex than previously thought. Sar or Harosa is a clade that includes stramenopiles (heterokonts), alveolates, and Rhizaria. The first letter of each group provides the "SAR" in the name. The cryptomonads-haptophytes assemblage is a proposed monophyletic grouping of unicellular eukaryotes that are not included in the SAR supergroup. Several alternative names have been used for the group, including Hacrobia ; CCTH ; and "Eukaryomonadae". The Pelagibacterales is an order in the Alphaproteobacteria composed of free-living bacteria that make up roughly one in three cells at the ocean's surface. Overall, members of the Pelagibacterales are estimated to make up between a quarter and a half of all prokaryotic cells in the ocean. Halvaria is a grouping that includes Alveolata and Heterokonta (Stramenopiles). Rickettsia peacockii is a species of gram negative Alphaproteobacteria of the spotted fever group, identified from Rocky Mountain wood ticks. Its type strain is SkalkahoT. The organism is passed transstadially and transovarially, and infections are localized in ovarial tissues. Magnetococcus marinus is a species of Alphaproteobacteria that has the peculiar ability to form a structure called a magnetosome, a membrane encased single-magnetic-domain mineral crystals formed by biomineralisation, which allows the cells to orientate along the Earth’s geomagnetic field. ↑ Garrity, George (2005). Bergey's Manual of Systematic Bacteriology. Springer. ISBN 978-0-387-24145-6. ↑ Werren JH, Baldo L, Clark ME (2008). "Wolbachia: master manipulators of invertebrate biology". Nat. Rev. Microbiol. 6 (10): 741–51. doi:10.1038/nrmicro1969. PMID 18794912. 1 2 3 Ferla, M. P.; Thrash, J. C.; Giovannoni, S. J.; Patrick, W. M. (2013). "New rRNA gene-based phylogenies of the Alphaproteobacteria provide perspective on major groups, mitochondrial ancestry and phylogenetic instability". PLoS ONE. 8 (12): e83383. Bibcode:2013PLoSO...883383F. doi:10.1371/journal.pone.0083383. PMC 3859672 . PMID 24349502. ↑ Martijn J, Schulz F, Zaremba-Niedzwiedzka K, et al. (2015). "Single-cell genomics of a rare environmental alphaproteobacterium provides unique insights into Rickettsiaceae evolution". ISME J. 9 (11): 2373–85. doi:10.1038/ismej.2015.46. PMC 4497978 . PMID 25848874. ↑ Ferla MP, Thrash JC, Giovannoni SJ, Patrick WM (2013). "New rRNA gene-based phylogenies of the Alphaproteobacteria provide perspective on major groups, mitochondrial ancestry and phylogenetic instability". PLOS One. 8 (12): e83383. doi:10.1371/journal.pone.0083383. PMC 3859672 . PMID 24349502. ↑ Williams KP, Sobral BW, Dickerman AW (2007). "A robust species tree for the alphaproteobacteria". J. Bacteriol. 189 (13): 4578–86. doi:10.1128/JB.00269-07. PMC 1913456 . PMID 17483224. ↑ Thrash JC, Boyd A, Huggett MJ, et al. (2011). "Phylogenomic evidence for a common ancestor of mitochondria and the SAR11 clade". Sci Rep. 1: 13. Bibcode:2011NatSR...1E..13T. doi:10.1038/srep00013. PMC 3216501 . PMID 22355532. ↑ Viklund J, Ettema TJ, Andersson SG (2012). "Independent genome reduction and phylogenetic reclassification of the oceanic SAR11 clade". Mol. Biol. Evol. 29 (2): 599–615. doi:10.1093/molbev/msr203. PMID 21900598. ↑ Rodríguez-Ezpeleta N, Embley TM (2012). "The SAR11 group of alpha-proteobacteria is not related to the origin of mitochondria". PLoS ONE. 7 (1): e30520. Bibcode:2012PLoSO...730520R. doi:10.1371/journal.pone.0030520. PMC 3264578 . PMID 22291975. ↑ Darby AC, Cho NH, Fuxelius HH, Westberg J, Andersson SG (2007). "Intracellular pathogens go extreme: genome evolution in the Rickettsiales". Trends Genet. 23 (10): 511–20. doi:10.1016/j.tig.2007.08.002. PMID 17822801. This Alphaproteobacteria-related article is a stub. You can help Wikipedia by expanding it.